As we look at the images of the devastation left in the aftermath of the earthquake in Haiti, our hearts are pricked. The question is, will we quickly heal from the prick or will we be pierced to the core and do something about it? I pray that we will do something. I'm not saying that I know what you're supposed to do. I don't have a plan even for me yet. I just know we're supposed to do something. SOMETHING. And that something will look different for everyone. 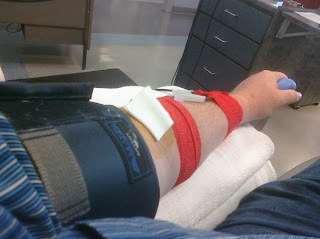 For example, today I gave platelets at LifeShare Blood Center. It didn't directly impact the victims of Haiti, but it was something. On the other hand, Lori is feeling a deep stirring to adopt an orphan from Haiti. She's on the computer next to me as I type this, researching the possibilities. That may not pan out either. But it's something she's supposed to do, for now. I believe this is the beauty of the Body of Christ. Each member is different and has a different purpose. And as each member receives their instructions directly from the Head of the Body, the Work gets accomplished - as long as each one does the "something" they're supposed to do. Your something may be HUGE. Or it may be small. It might be simply writing a check and sending it to a "boots-on-the-ground" agency there in Haiti. Or maybe it's collecting medical items to send to Haiti. Maybe it's going to Haiti yourself. (Ideas.) What are you supposed to do? Whatever it is, do YOUR something. And God will be honored. Thanks for the prompting! My cousin in Chicago told me tonight that she doesn't have any money so she is organizing a neighborhood clothing drive for Haiti. I thought that was a great idea. Please keep sharing ideas so that we can all find a way that works for us. That's neat what your cousin is doing. I pray folks will come up with creative ways of showing God's love. It's going to be important to sustain our care over the long haul as "compassion fatigue" is very real. I think right now money for the agencies on the ground is probably one of the highest priorities. And then over the long-haul short-term mission trips to clean and rebuild will be important. Thanks for the comment.